Authentic Soviet Red Army Soldier Winter Uniform Fur Hat "Ushanka". WW2 type. Winter uniform hat of soldiers of the armed forces of the USSR. 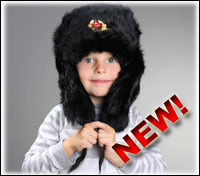 Practical warm hat, made of thick gray natural wool felt and military fur, that consists of 60% of sheepskin and 40% of polyester. Due to that the fur is very warm and resistant to rain and snow. Original Soviet Army Surplus, made in 1970-1990. Never used! Perfect Condition! Came from a military warehouse. Has military stamps inside. Grey-blue color. All badges are metal. They will be included not attached to the hat.